Editors: Shani, A.B., Mohrman, Susan Albers and Pasmore, William A., et.al. This handbook provides the latest thinking, methodologies and cases in the rapidly growing area of collaborative management research. 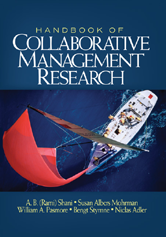 What makes collaborative management research different is its emphasis on creating a close partnership between scholars and practitioners in the search for knowledge concerning organizations and complex systems.